NuVectin - Does NuVectin Work? 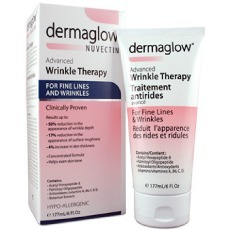 Question: I have seen a product called NuVectin that claims to be the leader in anti-wrinkle therapy. I want to try it but it’s a little pricey and I was hoping to know a little more about it before I go ahead and buy it. Can you tell me if this product is worth purchasing? Answer: NuVectin is a product that contains Acetyl Hexapeptide-3, and amino acid that the website claims is the most powerful amino acid in the fight against wrinkles. Amino acids are the building blocks of proteins, essential for the bodies healthy function but not scientifically proven to be effective as a topical treatment. According to their site, NuVectin has results similar to Botox or chemical peels without the risk or discomfort. On the product’s site, there is a full list of ingredients, and an explanation of why their product is the best, however, there is no mention of independent, clinical studies or scientific evidence to support their claims. NuVectin produces both a facial cream and an eye cream but warns consumers that there is a risk of redness and rash. Without more scientific evidence, it is hard to make a recommendation of this product. If you do shop for an anti-wrinkle product in a health store, pharmacy or on the Internet, you’ll often find hundreds of different brands containing a confusing array of ingredients. You may be tempted to experiment with different products until you find one that works. But this approach may be expensive. More importantly, not all products contain the quality and quantity of necessary ingredients to positively promote long-term improvements on the appearance of wrinkles and an overall healthy complexion. That’s why you’ll need to do a little bit of research to find the best, most potent brand for your needs.